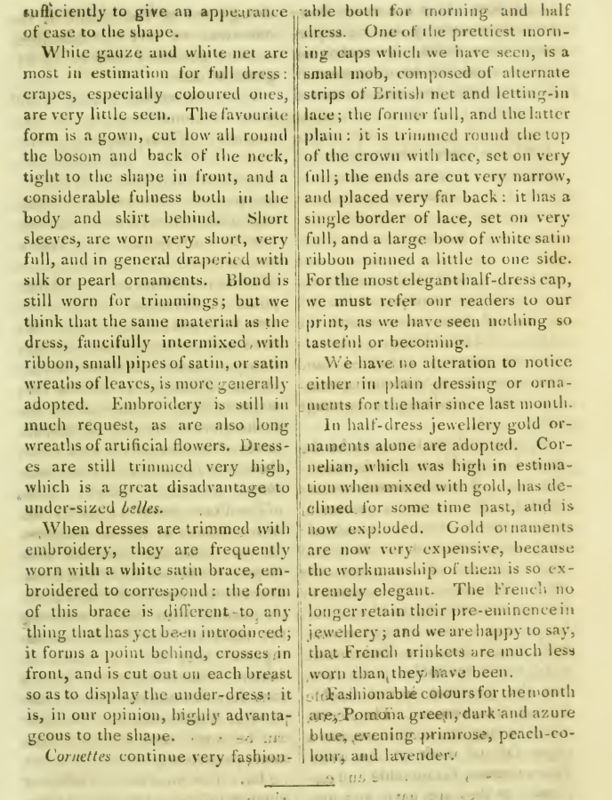 Both of the gowns featured in this month’s plates were provided by one of the magazine’s subscribers; perhaps said subscriber had a particular fondness for French roses, for they appear as a headdress atop the model of plate 23’s ball gown, too [Does anyone know what makes a rose “French”?] 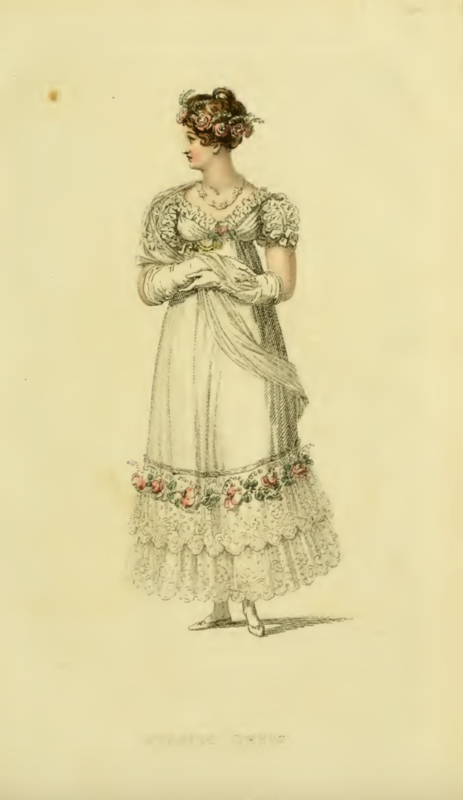 This ball gown also features a triple-trimmed hem: closest to the hem is a “rich rollio of intermingled gauze and satin”; in the middle is a “wreath of fancy flowers” [perhaps including some French roses? 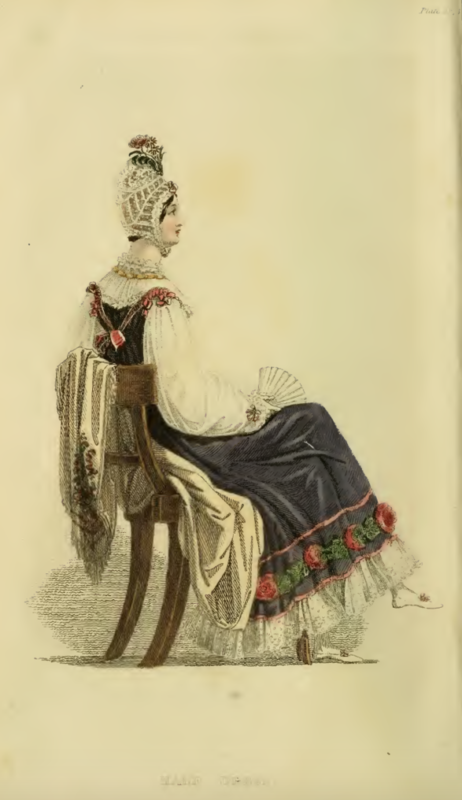 ]; white satin swags topped by small bows serve as the third band of adornment. 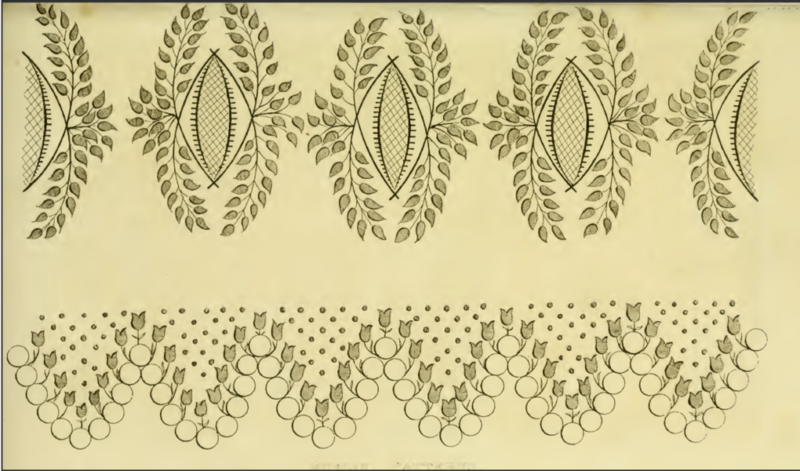 Trimming “uncommonly tasteful and striking,” opines our columnist. 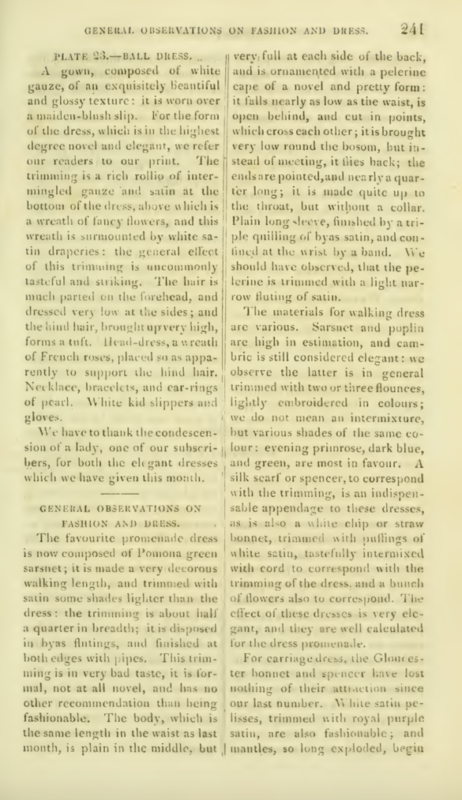 • Morning dresses, with their triple fall of work at the wrist, “have, at a distance, an uncommonly ludicrous effect; the trimming being pointed, and worked in holes, has the appearance, specially when there are so many falls of it, of being actually in rags.” Ah, what the élégantes will wear, all in the name of fashion! Stripes! 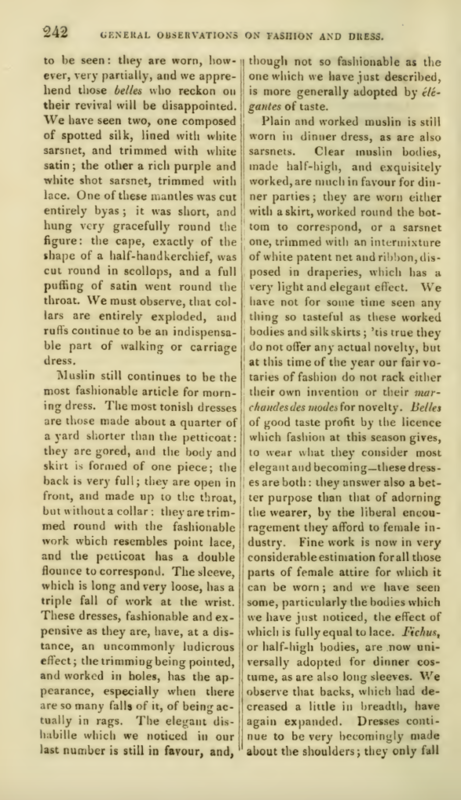 I can’t remember a previous gown featured in Ackermann’s Repository that featured stripes to the degree that plate 16’s half dress does. 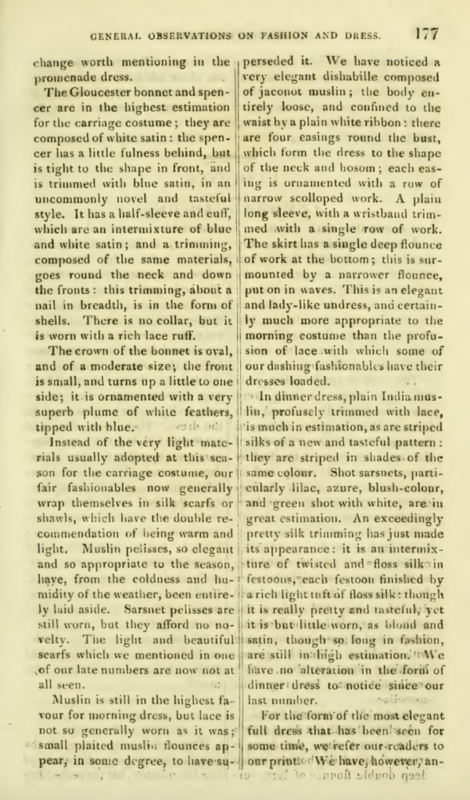 Not only is the gown itself made of striped sarsnet, the slippers that accompany it are, too! 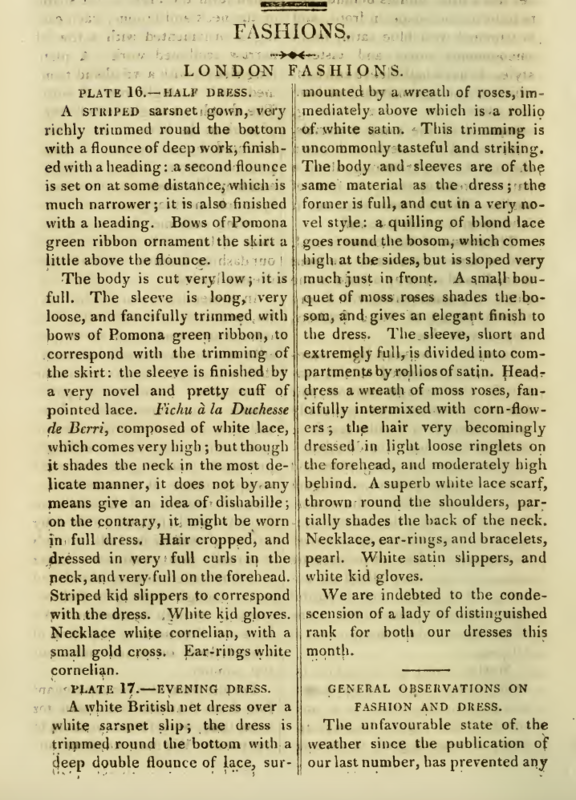 But in 1816, stripes alone are not enough to adorn even a simple day dress; the candy striped concoction here features two flounces of lace with headings, and bows of Pomona green above the highest flounce. 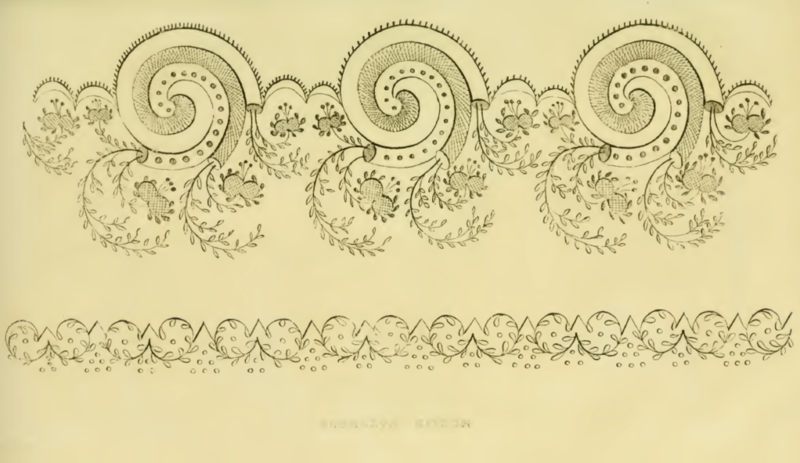 Similar bows run down the top of each sleeve, too. 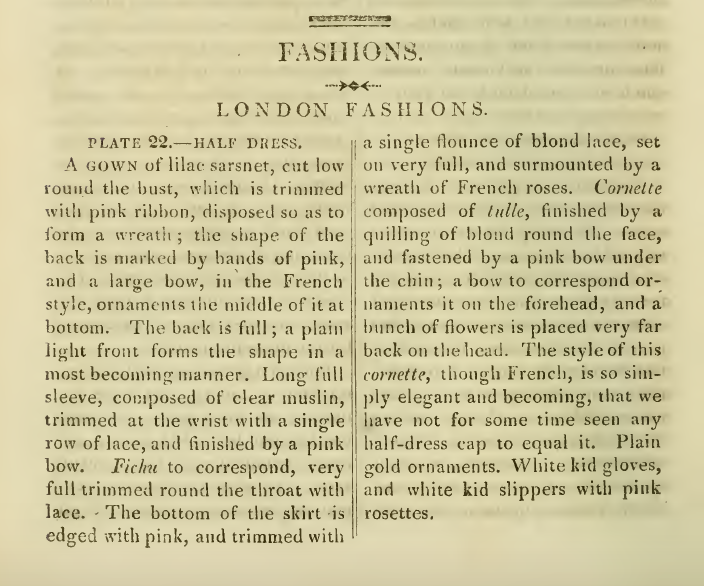 I think I would have preferred a striped dress to be weighted down with less adornment—would you? 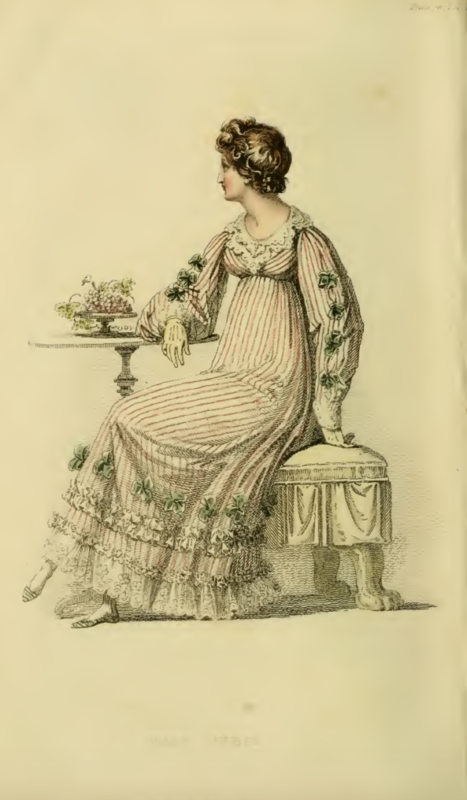 Plate 17 features a plain white evening dress—at least, plain in terms of its fabric, British net over a sarsnet slip. 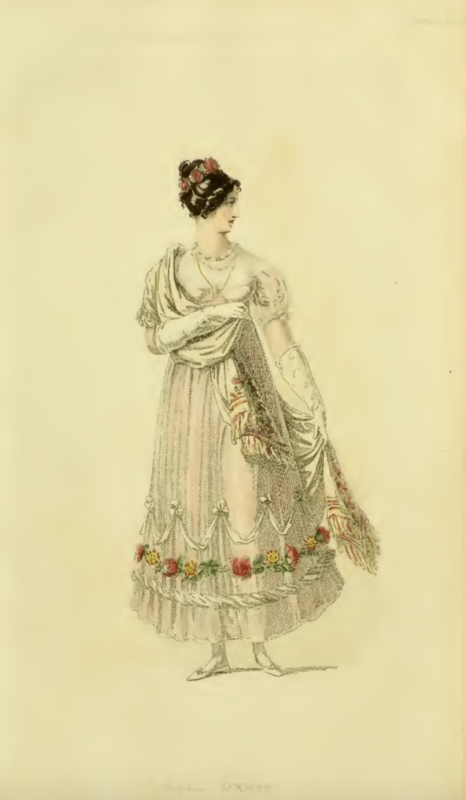 But the dress features as many embellishments as its companion day dress. 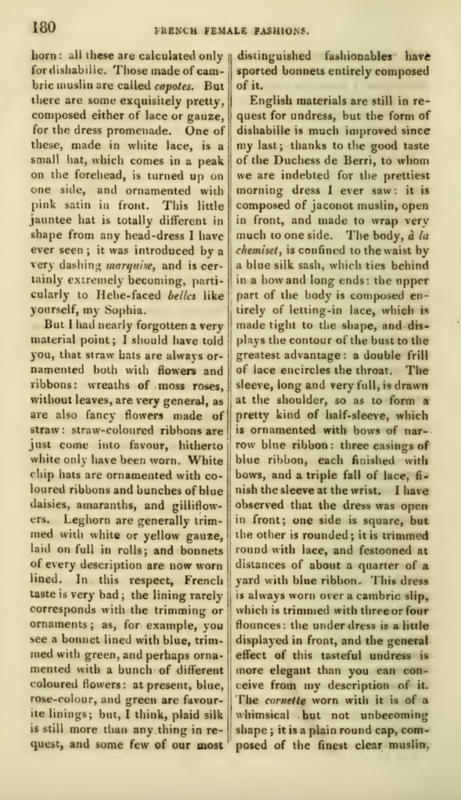 A double flounce of lace, a wreath of roses, and a rollio of white satin above the roses bring the skirt trimming almost to knee-height; a companion bouquet of moss roses “shades” the bosom, while a quilling of blond lace frames the bodice. 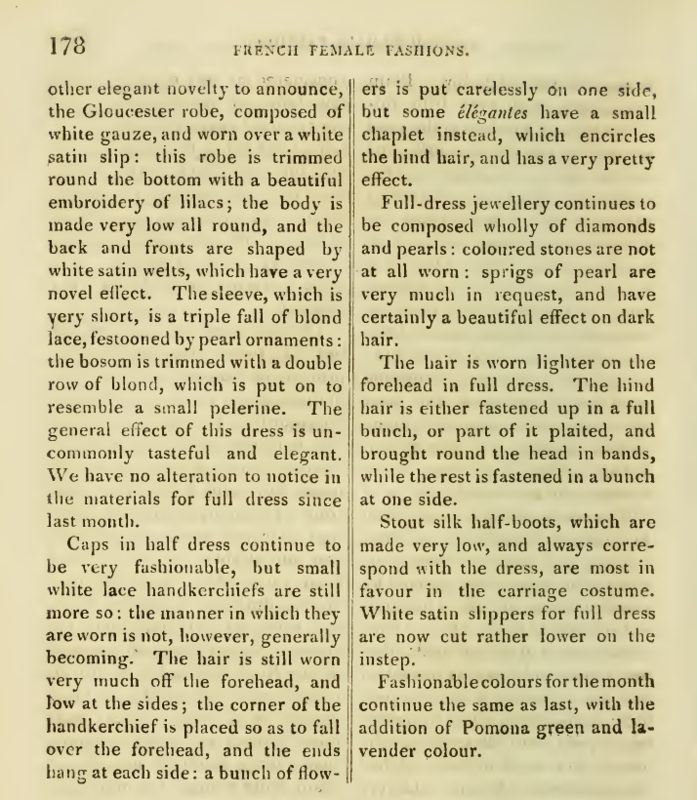 Even more detailed are the dress’s short and full sleeves, which are “divided into compartments by rollios of satin.” (FYI, a “rollio” is a type of rolled trimming, used for decoration; according to Cunnington’s Dictionary of English Costume, fabric is “rolled into a very narrow tubular shape”). Pearls are the jewelry of choice for this gown. Was it made for a very young lady? 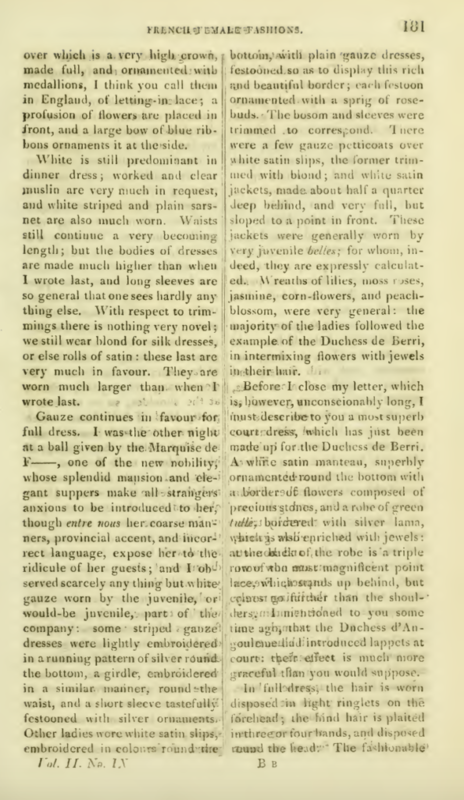 The prevalence of “Gloucester”-named apparel stems, I’m guessing, from the July 1816 marriage of the Duke of Gloucester and Edinburgh (1776-1834), nephew of George III, to King George’s fourth daughter, Princess Mary. Fashionable colors for September echo those of August, with the addition of Pomona green and lavender. 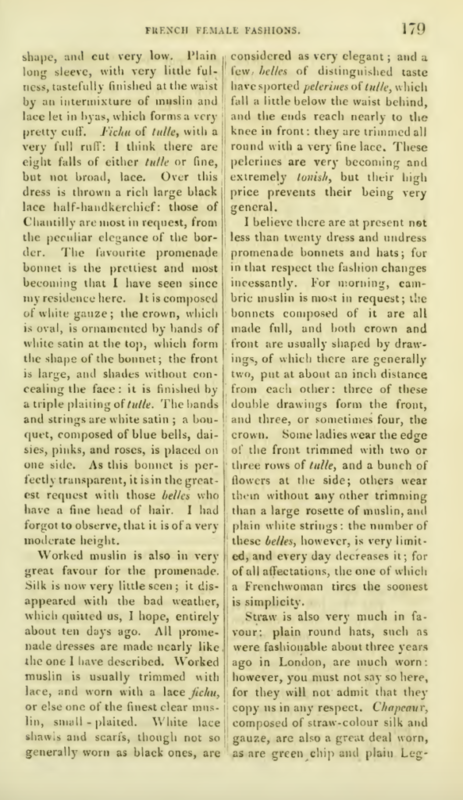 “for example, you see a bonnet lined with blue, trimmed with green, and perhaps ornamented with a bunch of different coloured flowers; at present, blue, rose-colour, and green are favourite linings; but, I think, plaid silk is still more than any thing in request, and some of our most distinguished fashionables have sported bonnets entirely composed of it” (180). 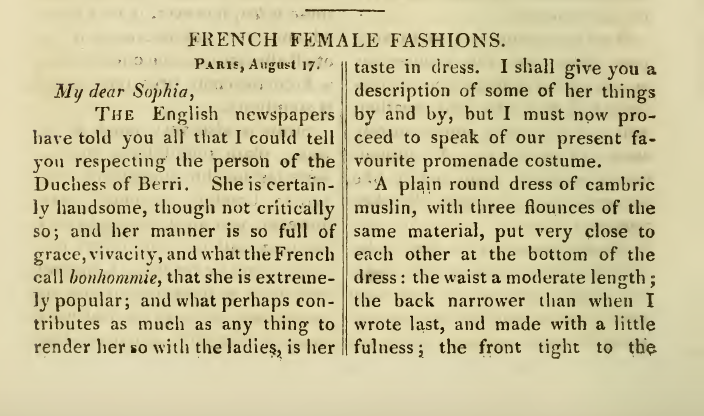 Luckily for French fashion, reports the correspondent, the Duchess of Berri (mother of the current heir to the French throne) sets the French style with her notable taste in dress.